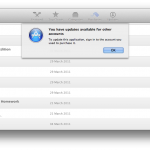 Mac App Store started rejecting updates for some apps. It offers “Update” button, but then rejects updating. The dialog on the image is common if a different Apple ID was used to purchase the app… except if that were the case, it’d be mentioning the exact Apple ID it wants be to update with. 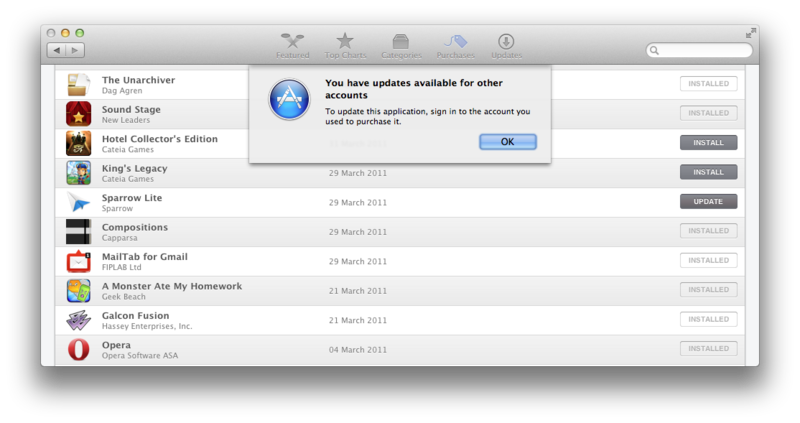 And, another problem: the apps were used using the only Apple ID I use for App Store purchases. So far, the only certain recourse was to delete the app and redownload it. If it’s associated with my Apple ID (double-check that it is!) there is no problem — the app will be newly installed and you’re good to go. Updates also only appeared when I checked the “purchases” tab, not when I went to the “updates” tab. A hacker’s note: The wording of the error is strange. You see, it only mentions an account — which may refer to your local account as much as it can refer to an Apple ID. So I went and played with permissions, changing the permission for “everyone” to “read & write” for the application in question. For a few apps, update then went through. For a few, it didn’t. The above is, naturally, from the “Get info” dialog on the app. This error can happen if Settings -> Spotlight has the Macintosh HD in the Privacy section (not to be indexed). Reason being App Store uses Spotlight. If you don’t do this and Spotlight can index the Apps then it finds the updates and works okay. EDIT Oct 11 2012, 14:58 CET: Also, while trying to figure out why Spotlight is so slow to starts indexing again on my machine, I found a thread that mentions the problem from my post. Their solution? Delete contents of /var/folders. Not the /var/folders directory itself, but its contents. Unrelated but helpful tip: sudo opensnoop -n processname helps you see filepaths that a process accesses. Useful with mdworker. This entry was posted in Mac, Mac OS X and tagged Mac App Store, updates on August 24, 2012 by Ivan Vučica. I was having same problem with updating Xcode. As per your instructions, I toggled the sharing & permission and toggled them back after waiting for a few seconds, then force quitted App Store app. 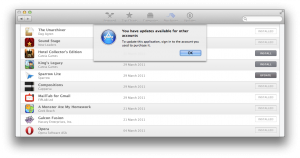 When I restarted the App Store app, it detected Xcode update was available! Thanks! Agreed. The permissions toggle did the trick. Thanks so much! Permission change fixed the issue!!! How do I “toggle sharing & permission ? the sharing & permission worked for me ! Yep, toggling the toggler worked.